Thanks to St. Elizabeth Healthcare Sports Medicine for sponsoring our girls’ high school basketball coverage once again this season. See all of our girls’ basketball stories here and watch for state tournament coverage March 8-12 from BB&T Arena on the campus of Northern Kentucky University. 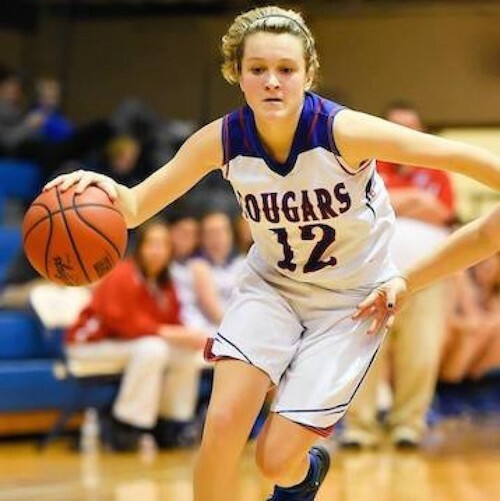 After letting a 14-point lead slip away in the fourth quarter, Conner needed a 6-0 run in the final minute to defeat Cooper, 61-57, in the 33rd District girls’ basketball final on Thursday at Boone County High School. Conner’s final six points were a field goal by senior Caylee Duncan and four free throws by sophomore Maddie Burcham. They were two of the Cougars’ four double-figure scorers. Sophomore guard Courtney Hurst had a team-high 15 points with nine coming in the first half when Conner took a 30-21 lead. The Cougars extended the lead to 50-36 in the third quarter, but Cooper mounted a comeback in the final period when junior guard Lexi Held scored nine of her game-high 21 points. Both teams will play in the 9th Region tournament that begins Monday at BB&T Arena. The bracket and first-round pairings will be determined during a draw scheduled for 10 a.m. Saturday at Holmes High School. Cooper will be making its first appearance in the regional tournament. This is the third time in the last four years that Conner has earned a spot in the eight-team bracket. CONNER (26-6): Strange 3 3 9, Hurst 5 3 15, McLemore 4 3 11, Burcham 2 6 10, Kennedy 2 0 4, Duncan 5 2 12. Totals: 21 17 61. Three-pointers: CON — Hurst 2. COOP — Held 3, M. Smith 2, Bleska 2. Highlands won the 35th District championship game for the third consecutive year behind a strong performance by sophomore guard Zoie Barth, who had 23 points, seven rebounds, five assists and six steals. Highlands shot 47.8 percent (22 of 46) from the field while NewCath connected on 34 percent (16 of 47). The Bluebirds also had a 36-21 rebounding advantage. Both teams advance to the 9th Region tournament that begins Monday at BB&T Arena. The pairings draw will be 10 a.m. Saturday at Holmes High School. Campbell County outscored Scott, 19-10, in the fourth quarter to win the 36th District championship game for the eighth time in the last 10 years. Junior guard Taylor Clos scored 11 of her game-high 27 points to lead the Camels’ late charge. The team’s other double-figure scorers were junior forwards Mackenzie Schwarber with 13 and Alexis Keeton with 10. Scott junior Anna Clephane finished with a game-high 28 points. She made 11 of her team’s 17 field goals overall, including five of seven in the second half. Both teams will compete in next week’s 10th Region tournament at Harrison County High School. Campbell County beat Scott in last year’s regional championship game. Championship: Simon Kenton vs. Grant County, 7 p.m.
Championship: Lloyd vs. Dixie Heights, 6 p.m.
Championship: Holmes vs. Holy Cross, 7:30 p.m.